Now offering online ordering through Paypal. Gives flexibility of paying securely via Paypal account or credit/debit card. The allegory will stir the deep inner desires in your heart to know God. The devotional guides will guide you into finding the peace, power and purpose for which you were created - the abundant life! Intimacy and love are two things we as humans crave. We desire to be valued and to feel worthy. Jesus longs to free you of brokenness and insecurity and cover you with His love. Discover your place of intimacy with Jesus known as the "Secret Place". In this secret place, you will learn the reality of Jesus' desire for you and walk in the promise of His healing power. As you read His Secret Garden Within You, you will embark on a journey to freedom and wholeness. Throughout this allegorical journey, as you take Jesus' hand, you will be awakened to a world of His presence within you. Only He can bring true restoration and healing, making you fully alive. Translated into 8 languages --French, Indonesian, Chinese, Spanish, German, Afrikaans, Portuguese, and Braille. The first 4 were still active as of 5/98. This revised, updated and expanded edition has not changed the foundational truths based on God's Word. However, there are more personal examples, greater insights as to application and new information in areas such as abuse. Article - Yes, You Can! This book gives God’s principles for keeping your husband happy while unlocking new joy and fulfillment for yourself. These truths are critical for our maturing in Christ because we learn to relate to God via others. Even though marriage is the central focus, all women, regardless of their status, can benefit because the truths apply to other close relationships. The 10 one hour long messages were taught and recorded to a group in Atlanta, GA. The 8 forty-five minute messages were taught to an audience in Dalton, GA. This leader’s guide is designed to teach the class through group discussion. Illustrative drawings are included. This book teaches how to let Jesus Christ be your inner mate resulting in 1) a healthy self-image, 2) finding peace and joy regardless of the circumstances by walking in His presence, 3) enjoying others rather than abusing them by trying to get them to meet needs that only Jesus can meet. Many other truths are shared which are necessary for maturity. This is a sequel to the book, You Can Be the Wife of a Happy Husband. A guide to help apply the truths to your personal life as well as an amplification of many of the truths. 55 Pages (81/1”X11). The guide is designed to teach the class through group discussion. Visual aids are included. The 10 messages (1 hour each) were taught to a group of women in North Georgia. 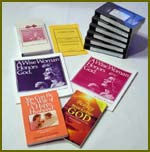 This series is the most comprehensive series available. The central truths from You Can Be The Wife of a Happy Husband, The Beauty of Beholding God and 10 years of insightful truths are combined into a unique, all inclusive series. The series is available only by listening to the audio or videotapes. Both of the above books are required for this course. The 12 messages are each 45 minutes in length. This 12 lesson (45minutes) series is divided into 2 parts. Part I covers the first 6 lessons. Part II covers the last 6 lessons. This division makes it easier for those wishing to complete the series at different times. The workbooks include visual aides and detailed instructions for each day - quiet time guide, questions aiding in application and reading assignments. Once the course is completed both books (HH & BBG) will have been read. Note that all WW materials are reduced when bought as a set. Workbook for Part I has 70 pages and workbook for Part II has 65 pages. The original and complete allegory by Hannah Hurnard with a daily devotional by Darien B. Cooper. The devotionals are designed to help you know: who you are in Christ, who your God is, and how to live in His presence as a way of life so that struggles are turned into personal victories. There are over 150 devotions. Twenty-four years after Darien Cooper told how to be the wife of a happy husband, she now tells how to be a happy woman. Her latest release tells how to be the happy mom of a full or an empty nest. You will learn how to relate to your family of origin, in-laws, siblings and other adults on the basis of mutual respect, honor, and esteem. As you cleave to your mate and weave in other healthy family relationships, God can change you into His likeness.